This set of Python Technical Questions & Answers focuses on “While/For Loops”. Explanation: The else part is executed if control doesn’t break out of the loop. Explanation: The first statement creates a generator object. Explanation: We can loop over a generator object only once. string = "my name is x"
Explanation: Variable i takes the value of one character at a time. Explanation: Variable i takes the value of one word at a time. Explanation: The value of a[-1] changes in each iteration. Explanation: The value of a changes in each iteration. Since the first value that it takes is itself, there is no visible error in the current example. Explanation: SyntaxError, not in isn’t allowed in for loops. 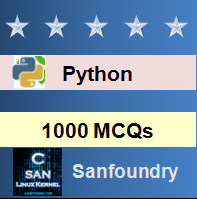 To practice all technical questions on Python, here is complete set of 1000+ Multiple Choice Questions and Answers.